Hi, This is first update of Micromax A300 Canvas Gold Stock Rom V4 by Micromax. In this update Micromax increased volume parameters for receiver and fix wifi issue. Stock Rom v4 get new Default wallpaper and Common partition for app and mass storage. You can get Stock Rom v4 of Canvas Gold and flashing/updating guide by this post. In this flash/update guide you will find all steps with image, therefore it is safe and easy method of flash Stock Rom on your Canvas Gold. Micromax A300 Canvas Gold is powered by Octa-core 2.0 GHz Processor with Mediatek MT6592T chipset and 5.5-inch LTPS LCD touchscreen with 1080 x 1920 pixels Resolution with 16M colors. Canvas Gold run on Android OS, v4.4.2 (Kitkat) and it has 2GB RAM and 32GB ROM. The Micromax A300 Canvas Gold has superb performance, you must be root your phone, because root allows for you to use a maximum of your phone without any restrictions. After root you will install custom apps, ROM and setting in your phone. After root you can install custom Rom, custom setting and apps on your phone. Read Root Advantage and Disadvantage by this post then root your phone and install CMW recovery on your Micromax A300 Gold click here. 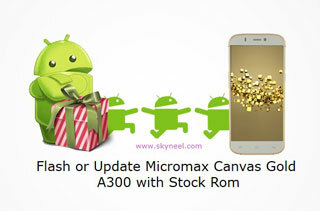 I hope you like this New update of Micromax A300 Canvas Gold Stock Rom V4 T26 installation guide from which you will be able to easily install New update of Micromax A300 Canvas Gold Stock Rom V4 T26 without any extra efforts. If feel any problem in this guide then please use comment box. Thanks to all. Please provide latest Android version for Micromax canvas gold A300. Will this format the phone storage completely? I’m on stock v1 and I don’t have any PC to backup.pls Help! Actually I’m in a bit of problem. I flashed a custom ROM not knowing that it was only meant for v4.Now it shows only the 2gb partition and the 25gb partition is lost.Many of them who did the same mistake have the same problem.what will I do? I can’t use the firmware upgrade while on custom ROM right? No try to install stock Rom v1, here is guide How to flash Stock ROM V1 for Micromax A300 Canvas Gold then upgrade this Stock Rom. i am very week in comp..and i cant follow the steps in these…i am totally get confused..
so plz,.. help me to get finish of these..
will the service centre people will do these for free? yes got to service center. Try to charge your phone Battery. Use SP-Tool v5.1408.00 but before it install Vcom driver on your PC. Man i did it. But lost my IMEI no. What should i do…..
if i not backup my phone nd start updating process so there is any risk?? or if backup is necessary plz tell how i backup my phone easily. It is depend on you if you want your backup after update then you should take backup of your phone. You can remove CWM recovery by flash other custom or stock recovery. rom is link is not opening..
Q- sir can i use SP Tool V5.1516.00 instead of SP Tool V5.1408.00 for updating my micromax A300? Q- sir what is the difference between SP Tool V5.1516.00 and SP Tool V5.1408.00? My phone is not detected. Plz help me. I followed all the steps. I did the update and phone is working fine…I faced hell lot of problem with windows 8 but managed to update using windows 7. Thanks for the info and support. can we do T26 update from micromax service center?? try to follow these steps, you can update your phone by your self. I tried to upgrade .. my phone is not getting connected to sp tool no matter what. my laptop is running windows 8.1 pro. I installed ADB driver. phone gets detected when it is switched ON but when i connect phone when switch OFF it connects and disconnects again immediately… PC detects as MT65xx preloader and disconnects again… please help . as phone is not connecting to SP tool. Abhi shek ji me Jogeshwari mumbai me rehta hu, yaha service centre me T26 update ka kisi ko kuch pata nahi hay, pls aap mujhe bata sakte ho me kaha se update karwau, my contact no is 9820915518. You can update our phone by follow all steps one by one. the mobile is not getting detected.. i have tried it a hundred times, followed all the steps precisely. it just starts charging when i connect it after choosing download. hey thanks… i got the issue solved. the problem actually was with the driver. i had to install the preloader driver which stops the mobile from charging when connected to pc in a switched off condition… this will be helpful for people having the same issue. 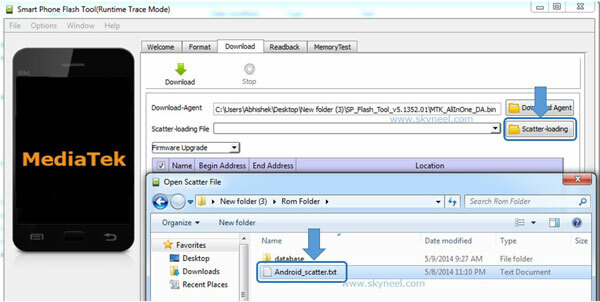 you can watch the video on youtube “how to install mtk preloader 65xx”. its a bit troublesome on windows 8.1 and 10. once done, follow the steps. its works fine and smooth..
will this remove my root?? any problems occur in future..? any help for me to solve this problem…. anyone can tell that the version of this stock rom which has upload by the author? is it 4.4.4 or not ? Service center’s people told me that they are not updating my rom to v4t26……so what i hve to do now?? Follow these steps, you can update your phone by your self. is it service center’s duty ? Can i go service center for update of stock rom? They are gonna help me or not ? yes, you can also update your phone by service center’s. Can you please tell me, will this update solve internal memory issues in the phone ?? Yes this is a official update and you can also update by service centre. Don’t worry, click on option in the SP tool then select download and check USB checksum in the DA DL ALL with checksum and install USB driver Then follow these steps and flash your stock Rom again. MY Micromax Canvas Gold A300 is working fine after root process shared by you. Can you please suggest if this can be upgraded to Lollipop. When Micromax will release Lollipop then you will find Lollipop Rom with guide here. when I click on firmware upgrade and then on download and connected my switched off A300 to PC nothing is happening. I have waited for ages but the download percentage bar in yellow is not even appearing. Is this means download not starting? I have checked my net connection. it is working fine. Please help. 1. did you connect switch off phone? 2. did SP tool detect your phone? It’s ok. It is solved now. I did a mistake earlier. I connected the switched off phone before pressing download button…that’s why it was not detecting my phone. Now it is installed. Thanks you very much for this update. Many like me are grateful to you. install vcom driver and charge your battery then connect your phone. Use ADB driver and Switch off your phone and wait for a min then connect your phone to PC. Thanks a lot. ADB drivers can be installed by ADB program. It’s a little troublesome in Windows 8. This ROM is awesome. – Over 20 GB app can be installed. – Audio quality is improved. – Phone heats up less. – All features are working. Camera. WiFi. BT. everything. – No custom kernel required as it is a factory update. does it work plz tell.n wat will happen if my phone gets bricked????????? Don’t worry, Just follow all steps one by one. but use only upgrade option. Sir any driver is not working i have tried all drivers but it is not recognizing my phone and starts charging plz help. Which is your Windows version? Sir any driver is not working in my win 8.1 pro 64 bit i have tried all drivers but it is not recognizing my phone and starts charging plz help.